Diego Alberto Milito (born 12 June 1979) is an Argentine former professional footballer who played as a striker. He has been nicknamed El Príncipe ("The Prince" in Spanish) because of his physical resemblance with former Uruguayan footballer Enzo Francescoli, who had the same nickname. A prolific and consistent centre-forward, Milito has averaged just over a goal every two appearances over the course of his professional career. Diego Milito started playing at Argentine first division team Racing Club in 1999, where he won the 2001 Apertura tournament. During this time, his younger brother Gabriel played for Racing's main rival, Independiente, as a defender. The two clubs would contest the Avellaneda derby with the two brothers lining up against each other. At the beginning of 2004, Milito moved to Italian second division club Genoa for £8 million. After two very successful seasons, where he scored 33 goals in 59 matches in Italy, Genoa were relegated down to Serie C1 as a punishment for an alleged match-fixing case in the final match of the 2004–05 season against Venezia. Due to this, Milito was forced to leave Genoa and would ultimately join his brother Gabriel at Real Zaragoza in the Spanish La Liga. Milito again showed his incredible potential in Spain, scoring four goals in the first semi-final of the 2006 Copa del Rey to beat Real Madrid 6–1. He finished the season as Zaragoza's top scorer with 16 goals in the first division. Milito was one of the top scorers in the 2006–07 La Liga season. He scored 23 goals, two fewer than league top goalscorer Ruud van Nistelrooy and three behind European Golden Boot winner Francesco Totti. In November 2006, it was reported Zaragoza decided to buy him outright after his two-year loan was set to expire. Milito became the club captain at Zaragoza, taking over this role from brother Gabriel, who departed for FC Barcelona in 2007. His contract was extended in August 2007 with a buy-out clause of €100 million. His goals helped Zaragoza to a sixth-place finish in the league. As of January 2008, Milito averaged higher than a goal every two games for Zaragoza, a statistic he also achieved with Genoa. In total, he managed 61 goals during his three seasons with Zaragoza. On 1 September 2008, just a few minutes before the transfer window closure time, Genoa completed the transfer of Milito from Zaragoza after the Spanish team were relegated to the Segunda División. His agent, Fernando Hidalgo, confirmed Milito chose explicitly to return to Genoa despite having received more lucrative offers from other major European clubs. He made his Serie A debut on 14 September against Milan. Genoa won the game 2–0 with Milito assisting the first goal and scoring the second. On 9 November, Milito scored his first hat-trick for Genoa in the 4–0 victory against Reggina. He finished the season with 24 goals in 31 league appearances, placing him second behind Zlatan Ibrahimović in the Capocannonieri scoring title. On 20 May 2009, La Gazzetta dello Sport confirmed that Diego Milito was transferred to Inter alongside teammate Thiago Motta. The transfer fees were €28 million and €10 million respectively but Genoa also received Robert Acquafresca, Leonardo Bonucci, Riccardo Meggiorini, Francesco Bolzoni, Ivan Fatić and cash in exchange. The striker adapted to his new surroundings quickly and had an excellent start to his Inter career, scoring two goals in a 2–0 World Football Challenge win over city rivals Milan. Subsequently, on 29 August, in his first ever Derby della Madonnina against Milan in Serie A, Milito assisted two goals and scored a penalty, his first league goal of the season, as Inter won 4–0. Later, on 13 September, he scored his second league goal in a 2–0 home win against Parma. In the next league match against Cagliari, he scored both goals for Inter in a 2–1 away win. These two goals placed him at the top of the all-time Serie A scoring charts for best strike rate, with 28 goals in 35 games, giving him an average of 0.8 goals per game. Milito continued his fine run of form with another goal in the next league match against Napoli, scoring the second goal after Samuel Eto'o scored in the first minute, a game that they won 3–1. 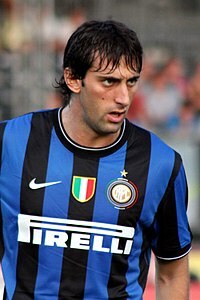 The consistency which Milito had shown at his previous clubs was sustained throughout his debut season at Inter, and after the first few matches, he had established himself as a key contributor to the squad. On 30 October, in a 5–3 home victory against Palermo, Milito, who had returned from an injury, came off the bench to make the result safe, scoring Inter's fifth goal. In the next game, against Livorno, he scored another goal, taking his strike rate up to seven goals in nine league matches. Three days later, on 4 November, he scored his first goal in the UEFA Champions League in a 2–1 Group Stage win over Dynamo Kyiv; it was the equaliser which led to Wesley Sneijder's game-winner in the 89th minute. On 24 February, in another Champions League match, this time in a 2–1 Round of 16 win against Chelsea, he scored another important goal, his second in the competition. Four days later, Milito netted the matchwinner which gave Inter Milan a 3–2 victory at Udinese, in a thrilling win for the Nerazzurri. On 27 March, after missing a 3–0 win over Livorno with a hamstring problem, Milito returned for a crucial battle at title contenders Roma, where he scored one goal in a 2–1 loss. On 31 March, in a 1–0 Champions League quarter-finals win against CSKA Moscow, he scored the winning goal which enhanced Inter's chances of reaching the semi-finals. Milito scored a vital goal and assisted twice in a 3–1 home win against FC Barcelona in the team's first leg semi-final win. During the very last matches of the 2009–10 season, Milito proved instrumental in Inter's winning of the first treble in the history of Italian football. The Argentine first scored the only goal in Inter's victory over Roma in the final of the Coppa Italia on 5 May 2010, enabling the Nerazzurri to take home their first trophy of the season. Eleven days later, it was also Milito's goal which secured Inter Milan's 18th Scudetto when they beat Siena 1–0 on the final matchday of Serie A. With only two points separating the top two teams in Serie A, the goal lifted Inter to the summit of the table after being in a position to lose the league title to Roma at the half-time break as Roma, playing simultaneously, were winning their own match against Chievo at that point. Milito himself declared this goal to be the "best of his career," having been decisive in delivering a league title to his team. There was more to come from the forward, however, and on 22 May 2010, Milito yet again proved vital as he scored twice to seal a victory in the Champions League Final over Bayern Munich. As a result, Inter became European club champions for the first time in 45 years with a 2–0 victory and completed their historic treble championship season. On 9 August 2010, Milito signed a new four-year contract with the Nerazzurri. On 26 August, Milito was named 2010 UEFA Forward and Player of the Year. On 26 August, at the ceremony called for the delivery of the UEFA Club Football Awards, Milito was voted the best striker in the previous season's European club by winning the prestigious UEFA Club Footballer of the Year. Inter followed the previous season's success with a victory in the Supercoppa Italiana against Roma. He failed to convert a penalty in the 90th minute, however, in the 2010 UEFA Super Cup match against UEFA Europa League champions Atlético Madrid; the game finished 2–0 for the Spaniards. He played his first match of the league on 30 August 2010 in week one against Bologna, where Inter started the season with a goalless draw. On 14 September, Milito scored an accidental own-goal in first match of group stage in Champions League against Twente. Eight days later, on 22 September, Milito scored his first goals of the season in a 4–0 win against nearly promoted club Bari at San Siro, helping the team to reach in top of the league. After that, he went to wait until 10 November to score his next goal, where he scored against Lecce to put his team ahead in 76th minute, but, however, Lecce would equalizing three minutes later with Uruguay international Rubén Olivera. He dedicated the goal to his team mate Walter Samuel, who three days ago ended his season after suffered a severe knee injury. In December, Milito scored a goal against Seongnam Ilhwa Chunma in the semi-finals of the 2010 FIFA Club World Cup; Inter went on to win the tournament. On 24 January 2011, Milito received an Oscar del Calcio award for "Best Football Foreign Player" and the "Best Footballer of the Year" for the 2009–10 season. Milito registered just eight goals in 34 appearances in an injury-plagued season as Inter finished the league in second place. On 27 November, Milito earned his 400th career appearance in the league match at Siena, which ended with a 1–0 away win for Nerazzurri, while on 18 December, in a 1–0 win over Cesena, he played his 100th game in Serie A. On 21 December, marks in a 4–1 win against Lecce in Inter's last match for 2011. On 7 January 2012, he scored twice and assisted goal of Giampaolo Pazzini in a 5–0 win against Parma at San Siro. On 15 January 2013, Inter won the Derby della Madonnina against Milan with the result 1–0, with Milito who scored the only goal in 54th minute after an assist from Javier Zanetti, his 200th for an Italian club across all competitive competitions. With his goal at Milan, he has scored seven goals in just nine derby matches played in Italy — four goals in four games in the Derby della Lanterna for Genoa against Sampdoria and three in five in the Derby della Madonnina. On 1 February, Milito scored all four Inter goals in a 4–4 draw at the San Siro against Palermo, the first four-goal game in the Serie A since Christian Vieri accomplished the feat for Inter against Brescia (4–0) on 1 December 2002. It was also his second four-goal game, the first accomplished with Real Zaragoza in a Copa del Rey match against Real Madrid on 8 February 2006. Milito scored a hat-trick on 1 April in a 5–4 win against his old club Genoa and added another hat-trick on 6 May in the Derby della Madonnina against Milan, where Inter won 4–2. With this feat, Milito overpassed Ronaldo's 49 goals in the all-time list of goals scored in an Inter shirt, with 50. It was also the fourth hat-trick scored in a Milan derby, after Altafini on 27 March 1960; Amadei on 6 November 1949; and Nyers on 1 November 1953. On 13 May, after the club's 3–1 loss against Lazio, Milito finished the season with 24 goals, four behind leader Zlatan Ibrahimović. Milito started the 2012–13 season scoring the second goal of a 0–3 final victory over Serie A newcomers Pescara in the first game of the season. On 28 October, he celebrated his 100th Serie A match in an Inter shirt, scoring his fourth goal of the season away against Bologna. Three days later, on 31 October, he scored his fifth goal against Sampdoria in a game that ended 3–2 for Inter; it was also his 200th career goal across all competitions. On 4 November, he scored a double in the match against Juventus in Turin, a 1–3 Inter win, endet Juventus 49 matches unbeaten run at Juventus Stadium. After Inter's 2–1 victory over Napoli on 9 December, where Milito registered a goal, Milito celebrated his 100th Serie win out of 197 games played between both Genoa and the Nerazzurri. With 28 goals scored, Milito also became the player with the most goals scored in the Serie A during the 2012 calendar year, ahead of Napoli's Edinson Cavani (27) and Udinese's Antonio Di Natale (23). Returning from an injury suffered in January on 10 February 2013, Milito marked his return in the home win against Chievo by scoring a goal and providing an assist on Esteban Cambiasso's strike. Milito's season injuries woes continued, however, as on 14 February, in a UEFA Europa League match against CFR Cluj, he was injured in the seventh minute with a collateral ligament injury, anterior cruciate ligament, and capsule in his left knee. Two days later, Milito announced that the surgery to repair the injury was a success, but that the player would not return to the pitch for at least six months, ruling him out of contention for the remainder of the season. Milito returned to action for Inter, against Sassuolo on 22 September 2013, having been on the bench in the previous match against Juventus. He scored a brace in a 7–0 away win over the Serie A newcomers. However, he was beset by injury yet again, putting him out for a further ten matches. He returned to the team on 6 January 2014 in a 1–0 away loss to Lazio, coming on as a late substitute. In total, Milito scored 75 goals in 171 appearances in all competitions during his five seasons with Inter, 62 of which were scored in Serie A. In 2014, it was confirmed Milito would come back to his first club, Racing Club, where he started his professional career. Milito scored on his Racing return to help the team to a 3–1 win over Defensa y Justicia on the opening weekend of the Argentine championship. On 26 August 2014, he scored a crucial goal with a penalty in the 1–0 victory against Arsenal de Sarandí in week four of Argentine Primera División. On 31 August 2014, Milito scored his third goal for Racing in a 2–1 loss against Independiente; he scored the goal in the 14th minute after an assist by Ricardo Centurión. He provided an assist for Gustavo Bou, who scored the first goal in a 2–1 win over Boca Juniors. He scored his fourth goal of the season in a 4–0 win over Estudiantes on 11 October. Milito continued his fine form, supplying his third assist of the season in a 1–1 draw against Club Olimpo. He assisted Gabriel Hauche in the 41st minute of the match. Milito scored the fifth and sixth of the season on 30 November in a match against Rosario Central, who ended with a 3–0 win away. After this win, Racing got to the top of the league and one match remained for it to be over. He participated on the play where Ricardo Centurión scored the crucial goal against Godoy Cruz. Racing was crowned 2014 Transición champion, meaning that the team qualified in 2015 Copa Libertadores second stage. That was Racing's first title after 13 years; Milito had also been on the side that won the title in 2001, and thus contributed to the club's only titles since 1966. Milito said that winning the league with Racing was a dream come true. On 21 May, Milito scored the opening goal from a penalty in a 2–0 win over Temperley, on the final match of his career, at the age of 36. In total, he ended his club career with 254 goals in 607 appearances in all competitions. Milito made his Argentina debut on 31 January 2003 against Honduras, where he also scored his first goal. He scored his second and third goals on 16 July 2003 against Uruguay, but appeared only intermittently during the following years and was omitted from the 2006 World Cup squad. He played for Argentina in the 2007 Copa América tournament, gaining playing time after Hernán Crespo's injury in a Group Stage match against Colombia, where he scored a goal; Argentina progressed to the final, where they were defeated 3–0 by Brazil. Milito's impressive performances during his time at Genoa led him to be called more often, especially under the reign of manager Diego Maradona, where Milito would often be deployed as a substitute. After his first season with Inter, Maradona included Milito in the Argentina squad for the 2010 FIFA World Cup in South Africa, where he would feature in two games as Argentina were eliminated 4–0 in the quarter-finals by Germany. On 1 June 2011, Milito was included in new Albiceleste manager Sergio Batista's 23-man squad ahead of the 2011 Copa América, along with his brother Gabriel and Inter teammates Javier Zanetti and Esteban Cambiasso. He did not feature in any matches during the competition with Argentina, who was eliminated in the quarter-finals by Uruguay after penalties. After retiring from professional football, Milito's last club, Racing Club, organised a tribute match in his honour on 12 November 2016, featuring many of his former team-mates, as well as friends and family members. At the age of 37, Milito scored two goals during the match, and was given a standing ovation from the Racing fans, who regard Milito as one of the club's most iconic players. A quick, dynamic, and technically gifted forward, with good vision, composure, and an eye for goal, Milito was known for his offensive movements and ability in the air, and was capable of finishing well with his head as well as both feet, despite being naturally right-footed. He was also an accurate penalty taker. Regarding his elegant yet efficient playing style, and his consistent, prolific goalscoring, Goal.com said of Milito in 2010: "His profession is football and his speciality is goals. He is one of the most impressive strikers in world of football today. He doesn't possess the same physical attributes as some of his fellow strikers, but he doesn't need them - he scores goals with ease and has always featured in top teams. Milito is a pure Number 9 and lethal in the penalty area." Diego Milito has Italian roots. His family emigrated to Argentina from Terranova da Sibari, Calabria. Diego is married to Sofía and they have three children. He is the older brother of former football player Gabriel, who he faced against in Champions League games during Gabriel's years playing for FC Barcelona, most notably in semi-finals of 2010, when both Diego and Gabriel were among their respective team's starting line-up. On 21 May 2016, the day of his retirement from professional football, Milito celebrated the birth of his third daughter, Morena. His son Leandro is currently a member of the Racing Club de Avellaneda Youth System. ^ "Diego Milito". uefa.com. UEFA. Retrieved 20 January 2017. ^ "Milito, l' uomo che parla poco corre molto e fa sempre gol" (in Italian). Corriere della Sera. 17 May 2010. Retrieved 7 August 2012. ^ a b c d e f g h i Matteo Politanò (14 November 2016). "Diego Milito ha dato l'addio al calcio: "Grazie Inter, non ti dimenticherò"" (in Italian). Panorama.it. Retrieved 14 November 2016. ^ a b "Prince Milito now the King of Inter". Four Four Two. 22 May 2010. Retrieved 24 May 2010. ^ "El Zaragoza ficha a Diego Milito" (in Spanish). UEFA.com. 30 August 2005. Retrieved 30 May 2010. ^ a b "Zaragoza demolish Real Madrid 6-1 in Cup semi-final". ESPN FC. 8 February 2006. Retrieved 7 November 2014. ^ a b "El Zaragoza humilla al Real Madrid en la Copa del Rey: 6-1". Marca. 8 February 2006. Retrieved 7 November 2014. ^ a b "Zaragoza demolish Real Madrid 6-1 in Cup semi". chinadaily.com.cn. 8 February 2006. Retrieved 7 November 2014. ^ "RealZaragoza.org - Espiritu Zaragocista". ^ "Zaragoza to use Milito option". Sky Sports. 28 November 2006. Retrieved 30 May 2010. ^ "Preziosi: "La situazione di Milito? Non chiara"". Genoa CFC (in Italian). 12 May 2007. Retrieved 30 May 2010. ^ "Fernandez' Argentinians lift Zaragoza". ^ "Diego Milito renueva con el Zaragoza" (in Spanish). UEFA.com. 31 August 2007. Archived from the original on 11 September 2010. Retrieved 30 May 2010. ^ "Milito returns to Genoa". Sky Sports. 1 September 2008. Retrieved 30 May 2010. ^ "DEPOSITATO IN LEGA IL CONTRATTO DI MILITO". Genoa CFC (in Italian). 1 September 2008. Retrieved 30 May 2010. ^ "Vi racconto il rifiuto di Crespo e il ritorno di Milito" (in Italian). Il Secolo XIX. 2 September 2008. Retrieved 3 September 2008. ^ "Genoa vs. Milan - 14 September 2008". Soccerway. 14 September 2008. Retrieved 5 December 2014. ^ "Genoa-Reggina 4-0: Milito manda in estasi il Marassi". Calcio Blog. 9 November 2008. Retrieved 5 December 2014. ^ "Genoa vs. Reggina - 9 November 2008". Soccerway. 9 November 2008. Retrieved 5 December 2014. ^ "Campionato di Serie A 2008/2009". Gazzetta.it (in Italian). Retrieved 16 December 2014. ^ "Milito e Motta all'Inter Al Genoa Acquafresca". La Gazzetta dello Sport (in Italian). 20 May 2009. Retrieved 23 May 2010. ^ "Diego Milito signs for Inter". inter.it. FC Internazionale Milano. 29 June 2009. Retrieved 29 December 2013. ^ a b c "Thiago Motta signs on". inter.it (FC Internazionale Milano official site). 1 July 2009. Retrieved 23 May 2010. ^ "Il Genoa in rima: con Pelé c' è Dembelé". La Gazzetta dello Sport (in Italian). 10 June 2009. Retrieved 21 December 2010. ^ "Milito hits brace to bury Rossoneri". ESPNsoccernet. 26 July 2009. Archived from the original on 9 March 2012. Retrieved 2 April 2010. ^ "AC Milan 0–4 Inter". F.C. Internazionale Milano. 29 August 2009. Retrieved 29 August 2014. ^ "Internazionale 2 – 0 Parma". ESPNsoccernet. 13 September 2009. Retrieved 2 April 2010. ^ "Cagliari 1 – 2 Internazionale". ESPNsoccernet. 20 September 2009. Retrieved 2 April 2010. ^ "Stats: Milito, the goal king". Inter Milan. 21 September 2009. Retrieved 2 April 2010. ^ "Internazionale 3 – 1 Napoli". ESPNsoccernet. 23 September 2009. Retrieved 2 April 2010. ^ "Inter 5–3 Palermo: Braces For Eto'o, Balotelli & Miccoli In Eight Goal Thriller". Goal.com. 29 October 2009. Retrieved 2 April 2010. ^ "Clinical finishing seals win". ESPNsoccernet. 1 November 2009. Retrieved 2 April 2010. ^ "Late drama seals win". ESPNsoccernet. 4 November 2009. Retrieved 2 April 2010. ^ "Cambiasso strike gives Italians slight advantage". ESPNsoccernet. 24 February 2010. Retrieved 2 April 2010. ^ "League leaders hang on". ESPNsoccernet. 28 February 2010. Retrieved 2 April 2010. ^ "Internazionale 3–0 Livorno". ESPNsoccernet. 25 March 2010. Retrieved 2 April 2010. ^ "Previews: Milito ready to return at Roma". FourFourTwo. 26 March 2010. Retrieved 2 April 2010. ^ "Toni the hero for title hopefuls". ESPNsoccernet. 27 March 2010. Retrieved 2 April 2010. ^ "Milito nets vital winner". ESPNsoccernet. 1 April 2010. Retrieved 2 April 2010. ^ "Internazionale vs. Barcelona - 20 April 2010". ESPNsoccernet. 20 April 2010. Retrieved 5 December 2014. ^ "Inter Milan 3 - 1 Barcelona". BBC Sport. 20 April 2010. Retrieved 5 December 2014. ^ "Inter Milan 3 Barcelona 1: Classy Italians muzzle Messi! Mourinho shows how to tame the champions". Daily Mail. 20 April 2010. Retrieved 5 December 2014. ^ "Inter claim first leg of possible treble". CNN. Turner Broadcasting System. 5 May 2010. Retrieved 6 May 2010. ^ "Siena vs. Internazionale - 16 May 2010". Soccerway. Soccerway. 16 May 2010. Retrieved 5 December 2010. ^ "Scudetto Goal Is Best of My Career – Inter Striker Diego Milito". Goal.com. 16 May 2010. Retrieved 16 May 2010. ^ Lyon, Sam (22 May 2010). "Bayern Munich 0 – 2 Inter Milan". BBC Sport. BBC. Retrieved 24 May 2010. ^ a b Williams, Richard (23 May 2010). "The New Diego – How Milito Won The Champions League". The Guardian. London. Retrieved 23 May 2010. ^ "Diego Milito signs new contract". FC Internazionale Milano. www.inter.it. 9 August 2010. Retrieved 23 June 2011. ^ "Milito signs new Inter Milan deal". Ontheminute.com. 9 August 2010. Retrieved 9 August 2010. ^ "Bologna 0-0 Inter: Nerazzurri Left Frustrated By Emiliano Viviano's Heroic Display". Goal.com. 30 August 2010. Retrieved 7 November 2014. ^ "FC Twente 2 Inter Milan 2: match report". Goal.com. 14 September 2010. Retrieved 7 November 2014. ^ "Inter 4-0 Bari: Samuel Eto'o And Diego Milito Bag Braces To Send Nerazzurri Top". Goal.com. 22 September 2010. Retrieved 7 November 2014. ^ "Lecce 1-1 Inter: Italian Champions Continue To Struggle". Goal.com. 10 November 2010. Retrieved 7 November 2014. ^ "Calcio Debate: Walter Samuel's Season-Ending Injury Means Inter Must Spend Money In The January Transfer Window". Goal.com. 8 November 2010. Retrieved 7 November 2014. ^ "Walter Samuel injury hits Inter hard". Online Sports on Net. 8 November 2010. Retrieved 7 November 2014. ^ "Siena 0-1 Inter: Castaignos nets last-minute winner to capture points for below-par visitors". Goal.com. 27 November 2011. Retrieved 17 December 2014. ^ "Cesena 0-1 Inter: Ranocchia header secures third Serie A win in a row for Claudio Ranieri's men". Goal.com. 18 December 2011. Retrieved 17 December 2014. ^ "Inter 4-1 Lecce: Nerazzurri recover from early setback to record confident victory". Goal.com. 21 December 2011. Retrieved 17 December 2014. ^ "Inter 5-0 Parma: Masterful Milito sends Ranieri's side to within three points of Champions League spots". Goal.com. 7 January 2012. Retrieved 17 December 2014. ^ "Milan vs. Internazionale 0 – 1". Soccerway.com. 15 January 2012. Retrieved 17 December 2014. ^ "AC Milan 0-1 Inter: Abate error allows Milito to clinch the spoils for Nerazzurri in derby della Madonnina". Goal.com. 15 January 2012. Retrieved 17 December 2014. ^ "Inter 4–4 Palermo: Milito and Miccoli exchange hat-tricks as enthralling contest ends with points shared". Goal.com. 1 February 2012. Retrieved 5 November 2014. ^ "Inter-Palermo 4–4 – Il tabellino". Calcio Mercato. 1 February 2012. Retrieved 5 November 2014. ^ "Lazio vs. Internazionale - 13 May 2012". Soccerway. 13 May 2012. Retrieved 5 December 2014. ^ "Classifica Marcatori" (in Italian). La Gazzetta dello Sport. Retrieved 25 September 2011. ^ "Pescara 0–3 Inter: Sneijder, Milito and Coutinho secure dominant win". Goal.com. 26 August 2012. Retrieved 2 November 2014. ^ "Bologna 1–3 Inter: In-form Nerazzurri make it five wins in a row". Goal.com. 28 October 2012. Retrieved 2 November 2014. ^ "Inter 3–2 Sampdoria: Milito, Palacio & Guarin send Nerazzurri second". Goal.com. 1 November 2012. Retrieved 2 November 2014. ^ "Juventus 1–3 Inter: Milito and Palacio end champions' unbeaten run". Goal.com. 3 November 2012. Retrieved 2 November 2014. ^ "Inter 2–1 Napoli: Guarin and Milito send Nerazzurri second in Serie A". Goal.com. 9 December 2012. Retrieved 2 November 2014. ^ "Inter 3–1 Chievo: Nerazzurri snap winless streak to move fourth". Goal.com. 10 February 2013. Retrieved 2 November 2014. ^ "Season over for Inter Milan's Diego Milito". Goal.com. 15 February 2013. Retrieved 2 November 2014. ^ "Sassuolo 0–7 Inter: Nerazzurri storm to rampant win". Goal.com. 22 September 2013. Retrieved 2 November 2014. ^ "Inter's Diego Milito suffers fresh injury". ESPN FC. 11 October 2013. Retrieved 2 November 2014. ^ "Lazio 1–0 Inter". BBC Sport. 6 January 2014. Retrieved 2 November 2014. ^ "Diego Milito returns "home" to Racing". Golazo Argentino. 19 June 2014. Retrieved 19 June 2014. ^ "South American Football – Milito scores on Racing return". Eurosport. 10 August 2014. Archived from the original on 19 August 2014. Retrieved 15 August 2014. ^ "Racing venció 1–0 a Arsenal con un penal agónico de Milito". Goal.com. 26 August 2014. Retrieved 26 August 2014. ^ "Argentine Primera Division Review: Boca beaten, River held". Sportal.com. 25 September 2014. Archived from the original on 16 October 2014. Retrieved 12 October 2014. ^ "Racing goleó 4–0 a Estudiantes y está más vivo que nunca". Goal.com. 11 October 2014. Retrieved 26 August 2014. ^ "Olimpo vs Racing Club – 26 October 2014". Soccerway. 26 October 2014. Retrieved 26 October 2014. ^ "Olimpo 1–1 Racing Club". Goal.com. 26 October 2014. Retrieved 26 October 2014. ^ "Racing le ganó a Central y sigue puntero". Goal.com. 30 November 2014. Retrieved 4 December 2014. ^ "Diego Milito's brace takes Racing Club on brink of Argentine league glory". Dnaindia.com. 1 December 2014. Retrieved 4 December 2014. ^ "Racing ends 13-year itch". Buenosairesherald.com. 15 December 2014. Retrieved 16 December 2014. ^ a b "Racing Club seal Argentine league title". Dailymail.co.uk. Daily Mail. 15 December 2014. Retrieved 16 December 2014. ^ a b c "Milito, doppietta e lacrime nella partita d'addio" (in Italian). Mediaset. 12 November 2016. Retrieved 14 November 2016. ^ "Milito: Racing title a dream come true". FIFA.com. 15 December 2014. Archived from the original on 16 December 2014. Retrieved 16 December 2014. ^ a b "Argentina, Milito, tutto in una notte: addio con gol e terza figlia" (in Italian). La Gazzetta dello Sport. 22 May 2016. Retrieved 22 May 2016. ^ "Argentina vs. Colombia - 3 July 2007". Soccerway. 3 July 2007. Retrieved 5 December 2014. ^ "Lista de los 23 jugadores convocados para la Selección Nacional" (in Spanish). AFA. 19 May 2010. Retrieved 19 May 2010. ^ White, Duncan (3 July 2010). "Argentina 0 Germany 4: match report". The Daily Telegraph. UK. Retrieved 3 July 2010. ^ "Batista announces Albiceleste squad". AFA. Retrieved 31 May 2011. ^ "Argentina 1-1 Uruguay (AET, 4-5 pens. ): Carlos Tevez penalty miss proves costly as hosts crash out of Copa America". Goal.com. Retrieved 16 December 2014. ^ "Argentina 1 Uruguay 1 (aet Uruguay win 5-4 on pens): Tevez penalty miss costs hosts place in semis". Daily Mail. Retrieved 16 December 2014. ^ "Milito, un principe sotto la Lanterna". Sky Sports (in Italian). 16 September 2008. Retrieved 16 November 2015. ^ Beppe Di Corrado (15 May 2009). "Diego Milito". Il Foglio (in Italian). Archived from the original on 17 November 2015. Retrieved 16 November 2015. ^ Roberto Perrone (24 May 2010). "Milito 10 e lode, i segreti del Principe". Corriere della Sera (in Italian). Retrieved 16 November 2015. ^ "Di Natale re dei rigoristi Ma il colpo è Hernanes" (in Italian). La Gazzetta dello Sport. 8 September 2011. Retrieved 22 August 2016. ^ "The Goal.com 50: Esteban Cambiasso (29) - Diego Milito". Goal.com. Retrieved 5 December 2010. ^ "Milito becomes father to Agustina". FC Internazionale Milano official site. 21 March 2010. Retrieved 30 May 2010. ^ "Diego Milito" (in Italian). Corriere dello Sport – Stadio. 1 June 2010. Archived from the original on 17 October 2014. ^ "Storie di calabresi lontani da casa – I fratelli Milito". strill.it. 25 March 2012. Retrieved 5 January 2012. ^ "Diego Milito Player Profile – ESPN FC". ESPN FC. Retrieved 12 October 2014. ^ "Argentina – D. Milito – Profile with news, career statistics and history". Soccerway. Retrieved 12 October 2014. ^ "Diego Milito Football Statistics - WhoScored.com". WhoScored.com. Retrieved 12 October 2014. ^ "Diego Milito – Profile at Scoresway". Scoresway.com. Retrieved 29 October 2014. ^ a b "Diego Milito". National Football Teams. Benjamin Strack-Zimmerman. Retrieved 1 April 2010. ^ a b "D. Milito - Soccerway". Soccerway. Retrieved 4 November 2015. ^ "Inter claim first gong of the treble". ESPNsoccernet. ESPN. 5 May 2010. Retrieved 6 May 2010. ^ "Two-goal Eto'o fires Inter to more glory". UEFA.com. 21 August 2010. Archived from the original on 25 September 2010. Retrieved 30 September 2010. ^ a b c "Italy - Footballer of the Year". RSSSF. Archived from the original on 21 January 2015. Retrieved 30 September 2015. ^ "OSCAR AIC 2009: É TRIONFO NERAZZURRO" (in Italian). www.Inter.it. 18 January 2010. Retrieved 27 November 2017. ^ "CALCIO Gli Oscar del Aic Ibra, De Rossi e Mou" (in Italian). La Repubblica. 18 January 2010. Retrieved 27 November 2017. ^ "UEFA Club Forward of the Year". UEFA.com. 1 May 2011. Retrieved 28 November 2017. ^ "UEFA Club Footballer of the Year". UEFA.com. 1 May 2011. Retrieved 30 May 2016. ^ "World XI players". FifPro. FIFA. Retrieved 30 September 2015. This page is based on the Wikipedia article Diego Milito; it is used under the Creative Commons Attribution-ShareAlike 3.0 Unported License (CC-BY-SA). You may redistribute it, verbatim or modified, providing that you comply with the terms of the CC-BY-SA.